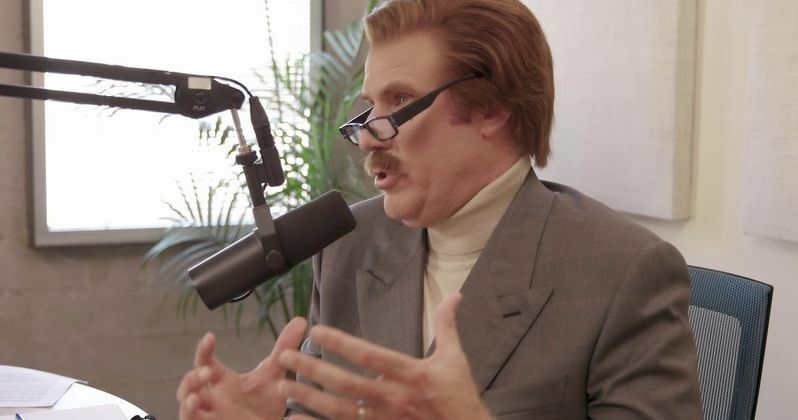 Will Ferrell is back as iconic Anchorman character Ron Burgundy for his new podcast. The new project released a hilarious trailer today and announced that the first episode will premiere on February 7th. iHeartMedia and Ferrell's Funny or Die announced The Ron Burgundy Podcast at the end of last year and many fans were wondering what they could expect from a character who doesn't even know what a podcast is. From the trailer, it looks like Burgundy has caught on to what it means to be a host who asks the hard-hitting questions. One of those hard-hitting questions that Ron Burgundy asks is, "Do chickens have epilepsy?" It just goes to show that Will Ferrell's Ron Burgundy has not changed at all in his move to a new format. For fans of both Anchorman movies, this new podcast will be right up their alley. However, it doesn't look like it's really made for people who are on the fence about the divisive comedy stylings of Will Ferrell. The Ron Burgundy Podcast will stream on the iHeartPodcast Network and for two 12-episode seasons. No guests have been announced as of this writing, but Burgundy is seen interviewing a chicken mascot in the trailer. It clearly looks like Will Ferrell is having a lot of fun in his new gig, spitting out one-liners as they pop into his head and trying hard not to make himself laugh too much. "I am a man who likes a good, rare pile of meat and a sip from a crystal goblet now and then," says Burgundy about his own lifestyle choices. Anchorman fans are more than likely hoping that Champ Kind, Brian Fantana, or Brick Tamland will drop by for some interview comedy and they just might do that. Other than that, Will Ferrell can pretty much have anyone on from just about any area of the entertainment world. While we don't know who will be on The Ron Burgundy Podcast, that news should drop soon since it debuts next week. In reality, Ferrell doesn't even really need guests, as he could just sit there and riff as Burgundy all day by reading a newspaper. Conal Byrne, President of the iHeartPodcast Network, had this to say about the podcast. "Ron believes he is the most qualified person in the world to host a podcast, but everything he says is just plain wrong. As I've stated before, iHeartRadio was forced into making this podcast with Ron. He has refused to stay away from our studios and is now camping out in a van across the street where he has recorded upwards of 100 cassette tapes of pure nonsense. We've been receiving daily deliveries of these tapes, and quite frankly, I am at a loss as to what to do with them." As for a possible Anchorman 3, that doesn't look like it's in the cards at the moment. However, you never know when it comes to Ron Burgundy, who can show up just about anywhere. Maybe the podcast will take off and take the character to new heights of success that nobody, not even the man himself, has dreamed of. Regardless of any sequels in the pipeline, Will Ferrell is coming back to a beloved character after releasing Holmes and Watson last year, which was a bit of a disaster. Thankfully, nobody is really talking about that movie anymore. You can watch the trailer for The Ron Burgundy Podcast below, thanks to the iHeartRadio YouTube channel. Anchorman 3 Has a Plot Set in Iraq Warzone, But Will It Happen?